EasyInstall Updates for registered customers. This update will update any EasyInstall version from 1.0 through 5.5 to the latest data. It must be installed on top of an existing installation and cannot be used as a stand-alone update. If you are performing a re-installation or installing on a new system, you must use your original installation to perform at least the first steps. Run the entire DVD portion of the installation as outlined in the user manual with the exception of the WinLPD program which has been replaced with a new (functional) program called “DDRLPD”. Once the system is installed to the point the virtual machines have completed extracting, you exit the DVD install and install the update. After the update is installed download the new EDIABAS image files using the included “EasyInstall Download” program on your desktop (this replaces the original BMW EDIABAS CD image files with our updated image files) and then continue the installation using the newest EDIABAS installers. Why? Part of the update includes new download file specifications for the virtual machines and the EDIABAS CD images, so the update will add programs that the CD installers will complete. Download and read the latest Download Installation Manual to complete the update as much may have changed since your original installation. Download installations are a bit different. You will install the basic “seed” file we provided you originally and then once the seed file (named “XXXXSetup.exe”, where the XXXX equals your assigned serial number such as “0001Setup.exe”). Once the seed file is done, you will install the update. Then run entire Download installation from there just as outlined in the installation manual. Part of the update includes new download file specifications for the virtual machines and the EDIABAS CD images, so the update will add programs that the CD installers will complete. Download and run the update following the included instructions. You do NOT have to re-run the EDIABAS CD installers as the EZUpdate will take care of replacing all the programs and will NOT alter the system environment other than adding to the Windows search path. If you’ve moved the original EasyInstall icons from the desktop to separate folders they will not be deleted and replaced. The replacement program icons will be placed in their original locations (some users will see different names than their original versions). For those users it is up to them to manually remove and replace the old icons. Finally, for those who have damaged or lost their original installation DVD or your original download program, there are options. Option 1: We can provide a “Download” version installer for you to get the latest programs (negating the need for this update). Option 2: or if you prefer a physical disk, we can build a replacement DVD and ship it to you for our normal $10.00 USD shipping cost. Note that the physical media can be ordered by both download and DVD customers. The website owner assumes no responsibility for the topicality, correctness, completeness or quality of information provided. Liability claims against the website owner relating to material or immaterial nature caused by use or disuse of the information or the use of incorrect or incomplete information are excluded. All offers are non-binding. ALL MATERIALS ARE PROVIDED “AS IS” WITHOUT WARRANTY OR ANY KIND. EXPRESS OR IMPLIED, INCLUDING WARRANTIES OF MERCHANTABILITY, FITNESS FOR A PARTICULAR PURPOSE, TITLE AND NON-INFRINGEMENT. MATERIALS MADE AVAILABLE ON THIS WEB SITE MAY INCLUDE INACCURACIES IN TECHNICAL DATA. pss-autosoft.NET DISCLAIMS ALL WARRANTIES AND MAKES NO GUARANTEES REGARDING THE QUALITY, ACCURACY, COMPLETENESS OR SUITABILITY OF ALL MATERIALS MADE AVAILABLE. IN NO EVENT WILL pss-autosoft.NET, OR ANY PERSON OR ENTITY INVOLVED IN CREATING, PRODUCING OR DISTRIBUTING INFORMATION AT THIS WEB SITE BE LIABLE FOR ANY DAMAGES, INCLUDING, WITHOUT LIMITATION TO, DIRECT, INDIRECT, INCIDENTAL, SPECIAL, CONSEQUENTIAL OR PUNITIVE DAMAGES ARISING OUT OF THE USE OF OR INABILITY TO USE CONTENT OR INFORMATION FROM pss-autosoft.net. WEB USERS HEREBY ACKNOWLEDGE THAT THE PROVISIONS OF THIS SECTION SHALL APPLY TO ALL CONTENT ON pss-autosoft.net. pss-autosoft.NET RESERVES THE RIGHT TO CHANGE ANY INFORMATOIN ON THIS WEB SITE AT ANY TIME. If you are the copyrigtht holder of any of the tools mentioned below and would like them to be removed from our page, please contact us via our contact page and we will immediately honor your request. We frequently are asked about various utility programs that others have authored and can sometimes be found on various web-sites. With the exception of the NCS Dummy tool, it seems that lately these files have been disappearing from the various English language sites, possibly due to the age of these applications and hosting costs for files that get a lot of downloads or perhaps just a lack of interest. We have downloaded the files we could find that we belive pertain to our users interest and for your convenience have stored the following files on our server. NCS Dummy should make life with NCS Expert a bit easier. NCS Dummy parses keyword trace files (FSW_PSW.TRC) or nettodata trace files (NETTODAT.TRC) and retrieves all possible parameters, control unit data and order options for each function. The parsed trace files can be viewed and modified in a graphical trace editor or exported to text files. NCS Dummy can be used to compare two trace files and show the differences. Furthermore NCS Dummy can disassemble and assemble NCS Expert data files to achieve functionality that is not possible with a stock NCS Expert installation. Here is the source page so you can download any updates (we don't make any attempts to keep the latest version on our site, what we offer here may be older that the most current version. Click this link for the NCS Dummy source on "bimmerforums". These specifications taken directly from the above linked webpage and may change without notice! 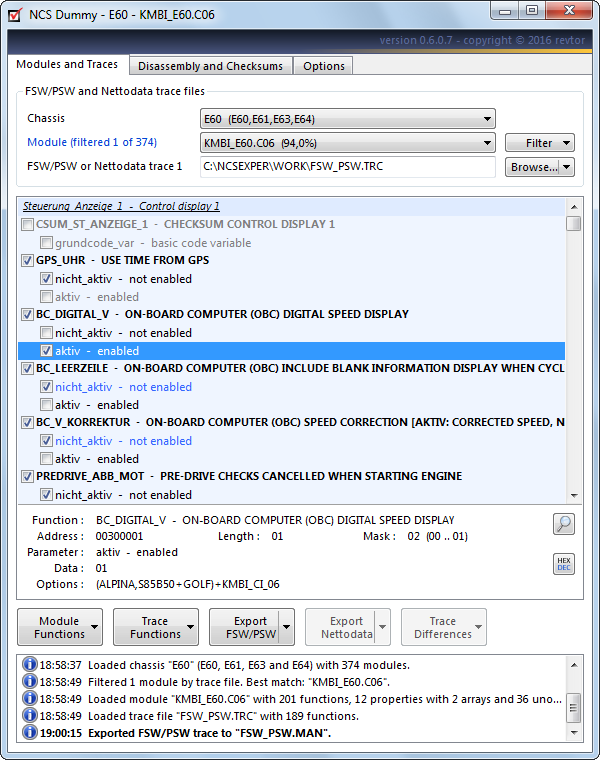 The program works in addition to EDIABAS with the engine ECU, with many DDE and DME models. The program allows you to read the necessary data from the engine control unit, read the indicators and basic parameters, conveniently also display in the form of sensors and record motor logs. 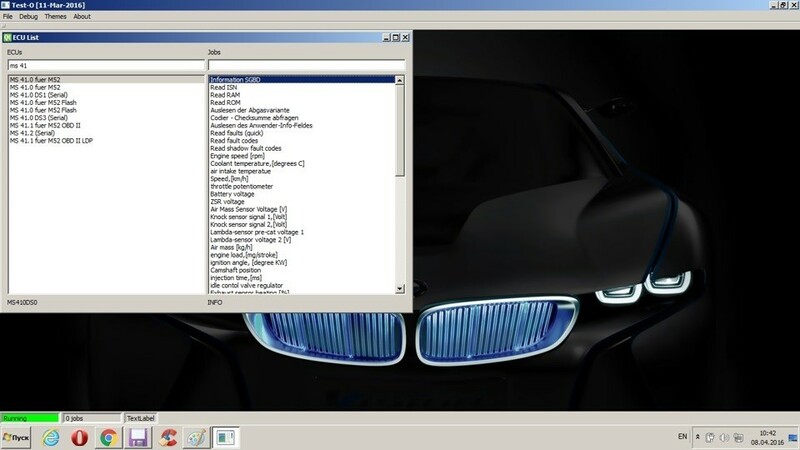 In order for the program to work correctly, the installed BMW EDIABAS Standard Tools package is required. Installation is a matter of unpacking the files using the 7zip tool (which you should have installed along with our basic systm). 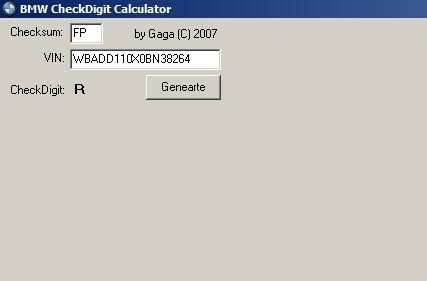 This is a utility used to calculate the checksum of the VIN.Installation is a matter of unpacking the files using the 7zip tool (which you should have installed along with our basic systm). 1. 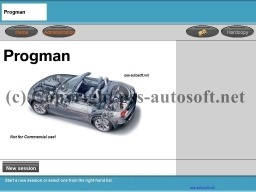 GM - contains information about the body, the steering, the engine model, etc. 2. SA - options installed in the car. 3. VN - list of computer versions of the computer (driver type) for the encoding. To add or remove an option, for example: 168, you need to recalculate SA and re-write it in the device (KMB) and EWS. And if you changed the engine you need to recalculate GM and rewrite it to auto using the NCS-Expert program. That is actually what Zeko can help and program. Extract the folder to your hard drive. Everything is in the "Zeko" folder, we suggest just placing it in your boot drive root directory. 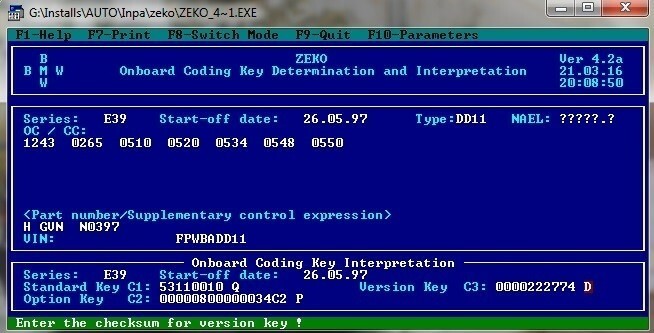 Press the F10 key to get to the parametrs file, chang the path for the Director where coding key tables are located: to reflect the actual path - here we set ours to "C:\zeko\data\"
Press F8 ky to switch to field 2. Enter the body number in the Series field (for example e39). Enter the date of production of the car in the "Start-off date" field (DD.MM.YY). Enter the codes for the ZCS components - enter the GM code in the C1 field. Enter the code in the C2 field SA. Enter the code in the C3 VN field. Switch mode using the function key (F8) to the field 1. Press the F4 button until the free field appears in the CA / CC. Enter the required options using the correct format. For example if using "168" then enter "0168". If necessary Remove the option then move to its field and press F5, and note how the bottom of the field 2 code SA changes, here is the recalculated code with the nwly added option 168., This is the data which you need to remember and write to the machine with NCS-Expert. These steps were taken from the Zeko source page which was in Russian, so we cannot attest to their completeness or accuracy as we had to use a translator to understand the page! Unfortunately this is a legacy 16 bit application and you MUST run it on a 32 bit version of Windows.